The field of Science and Technology Studies has attained global reach. In some regions, the study of science and technology has been around for more than five decades, already stabilized as a discipline in itself. During that time, this discipline has been expanded not only by incorporating insights from other disciplines –like the study of innovation dynamics- but also by adding different methodological traditions and a growing number of geographical boundaries. Beyond the traditional centres (North America and Europe) where the study of science and technology emerged, the discipline has been able to adapt to the aforementioned circumstances, developing interesting lessons and addressing multiple challenges along the way. For example, in the Latin American region, the early studies of science and technology were characterised by an approach that could be categorized as developmental, seeking to reduce the scientific and technological gap between this region and the “developed world”. Consequently, scholars oriented these studies on the creation of new public policies and institutional programs. How are studies of science, technology and innovation are influenced by the particularities of regional contexts? To what extent a decentering of the study of science, technology and innovation from its traditional focus on North America and Europe currently needed or already happening? What conceptual and methodological challenges do these type of studies face? Emeritus Professor Francesca Bray: University of Edinburgh. Specialising in China. Expert in rural development and everyday technologies. Dr Miguel Garcia-Sancho: Senior Lecturer at the University of Edinburgh. Expert in social studies of biomedicine, biotechnology, bioinformatics and genomics. Professor Pablo Kreimer: Universidad Nacional de Quilmes, Argentina. Specialising in Latin America. Expert in political sociology of knowledge, science and technology. Dr Eugenia Rodrigues: Lecturer at The University of Edinburgh. Expert in environmental monitoring, public engagement, the use of ICTs in environmental assessments, and citizen science. Professor Leandro Rodriguez: Professor at Universidad de las Américas Puebla, Mexico. Specialising in Latin America. Expert in the internationalisation of science and technology. Dr Niki Vermeulen: Senior Lecturer at the University of Edinburgh. Expert in science and innovation policy and scientific collaboration in the life sciences. Dr Michel Wahome: Researcher at the Oxford Internet Institute. Expert in digital entrepreneurship in Kenya and East Africa. Interested in understanding how technology shapes society and economy. Professor Robin Williams: University of Edinburgh. Specialising in China. Expert in Information and Communication Technologies, and Life Science Innovation. Director of the Institute for the Study of Science, Technology and Innovation at the University of Edinburgh. 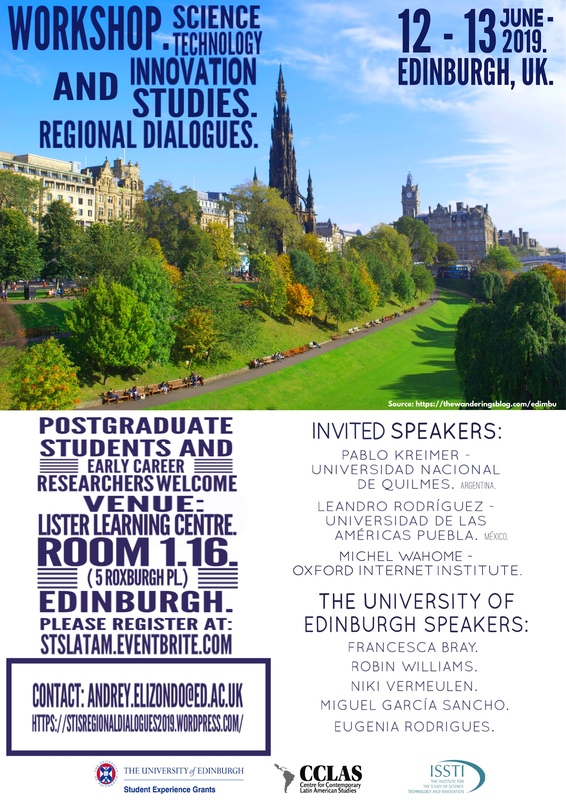 We encourage the participation of postgraduate students and early career researchers, but everyone is welcomed. Poster: title, topic, and 200 words abstract.